that will transform your life! That is one of my favorite verses. God has used that verse to help me get moving and keep moving concerning many areas of my spiritual growth. Another scripture that is helpful to me is 1 Samuel 30: 6. It says that David encouraged himself in the Lord. I realize I need to do that. It motivates me when I encourage myself in my small steps of progress. I have discovered two power words that when put together become a powerful tool in spiritual growth. In my walk with God, I take note of what I want more of in my life and then I make “I will” statements. When I use those two power words, I add determination to what I am saying. Step one is take note of one thing – just one thing - that seems hard for me in my daily life. Step two is to make some “I will” statements that are designed to move me forward. I make those statements, I write them down and I say those “I will” statements regularly. Step three is to find one or more Bible verses on that topic and say them out... loud regularly. I grow my faith that I can and will improve in this area. is also a helpful complement to this page. I am an expert in DISC personality material. Next to the Bible, it has been the body of knowledge that has helped me the most in my life. I love to share about the 4 DISC personality styles. It does not pigeon-hole anyone. It does not limit anyone. In fact, it empowers everyone in everything they do. 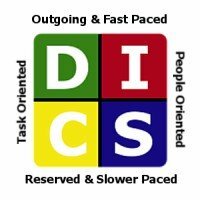 DISC is about understanding people. DISC involves 4 main personality styles. The style that contains most of your personality traits would be called your personality style. The next section shares some specific “I will” statements to help each of the four personality styles in their walk with the Lord. DISC has 4 main Personality Styles. The first style is the “D” style. The “D” style is so strong, direct, impatient and blunt that they frequently run over other people during the day. “Ds” often leave people bruised and wounded. They usually have difficulty being gentle enough. The next style is the “I” style. but they aren't always great finishers. in order to help you finish what you start. of all the “Is” you know! The “Is” really like attention! They really love to be celebrated! The next style is the “S” style. But sometimes God's plan for them will involve change. “Ss” can use their power words to help them with change. Hint - “Ss - ” it helps if you emphasize the words “I will”. The last style is the “C” style. I will fast worry this morning! In my book Praying for your Child, I go into more depth about each of those personality issues that I just highlighted. I give a lot of information on how to develop spiritual growth in each of the four personality styles. This is not a book just about parenting. The book gives many principles about spiritual growth that are helpful for adults as well as children. In my book MONEYstyles, I go into depth about how to get out of debt and get out of debt faster with DISC personality style information. This unique book fills in the gaps left by other "get out of debt" books. How to Work as a Team with your Spouse! If you like this page, please share it with your friends.